Pregnancy Tea – Red raspberry has been shown to reduce length of pushing in labor. When is it unsafe to drink herbal tea in pregnancy? There are safety concerns regarding herbal teas because herbal teas contain pharmacologically active constituents. In other words, they can stimulate or inhibit biological activity and can also interact with other drugs. 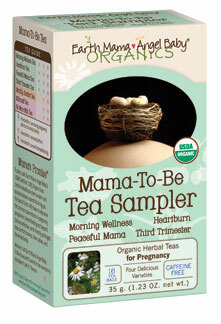 The primary reason herbal teas are unsafe during pregnancy is their interactions with other drugs. If you are taking other drugs it may be unsafe to drink certain herbal teas. Any tea you are taking regularly should be discussed with your doctor or pharmacist, and you may also ask them for a list of teas that could interact with any drug you are taking. Some herbal teas can, by themselves, cause actions that are unsafe. This is rare, and applies only to certain teas that are properly prepared in order to extract their biologically active components, and taken in quantities that can cause harm. Caution is more necessary when taking a tea regularly or intentionally for medicinal purposes. Some women are simply concerned with the safety of having a cup of herbal tea with breakfast or after dinner. Most herbal teas commonly used for pleasure drinking are safe in pregnancy, both because the herbal teas themselves are safe even in larger doses, and because a considerable amount of herbal tea – several cups daily over a few days – is necessary to achieve a medicinal effect. The few herbal teas that can be toxic in small amounts taste bad and are not commonly served. I recommend moderation and variety as safeguards for any problems that could arise with excessive use of commonly served herbal teas such as mint, orange, chamomile, ginger, and lemon. Licorice root may be worth extra caution. Licorice root is sometimes found in tea blends, and is should be avoided due its steroid-like properties. Other women are concerned about caffeine when they ask about tea and pregnancy. Black, green, yellow, oolong, and white tea do contain caffeine unless they are specifically label decaffeinated or caffeine free (because the caffeine has been removed). Herbals teas do not contain caffeine. Red, or Rooibus, tea is actually considered an herbal tea and so is also caffeine free. The amount of caffeine in tea varies, although teas typically have less caffeine than coffee. Caffeine should be limited during pregnancy, but does not need to be eliminated. These teas are healthful beverages with beneficial antioxidants. In moderation they are OK during pregnancy, and if you have a caffeine dependency using these teas to step your caffeine intake down is a great option. It is important to drink plenty of plain water when drinking these teas because non-herbal teas encourage the body to get rid of water. If you are interested in using teas for medicinal purposes or to promote health (herbal or otherwise) it is more crucial to understand the action of the teas in use. Teas may be very beneficial! But respect for the power of plants and knowledge about their use is important. Most herbal teas are not well researched, so the information available on safety is primarily anecdotal. This is one reason why herbal tea advice is often conservative. Safety has not been proven through research, and therefore practitioners will not recommend an herbal tea that they can’t guarantee is safe. If the potential for benefit is very low this makes sense, but many herbal teas may provide a significant benefit which might be lost due to caution. Information on the nutritional composition of herbal teas is readily available. Many herbal teas have a valuable nutritional role. While there are few double-blind randomized trials regarding herbal tea efficacy or safety, there is a wealth of traditional knowledge about herbal tea use. The use of herbal tea and pregnancy is part of a strong tradition of women’s health wisdom. Midwives and others have been using herbal tea beneficially since early history. If you are comfortable looking to traditional wisdom for information about the benefits and risks of various teas, and how to use them effectively, there is a wealth of information to glean. One of my favorite books sharing traditional wisdom about herbal tea and pregnancy is Susan Weed’s Wise Woman Herbal for the Childbearing Year. This book will share information on the safe and effective use of herbal teas for health promotion and herbal medicine during the childbearing year from conception through breastfeeding. Red raspberry leaf is the herb most often recommended for the healthful use of herbal tea and pregnancy. There was one double-blind, placebo controlled study done in Australia on the use of red raspberry leaf tea in pregnancy which found that drinking the herbal tea causes no negative effects on mothers or infants, and that those who drank the herbal tea pushed for less time then those who did not. There was also a 30% reduction in the use of forceps in the group of women who drank the herbal tea, and a slight decrease in the rate of C-sections*. I felt wonderful drinking this herbal tea, along with nettles, for my health during and after pregnancy. They did wonders for my constipation! I have many clients who have used them and feel they were very beneficial. Women have shared stories with me of the problems they have when they stop drinking these herbal teas for a week or more during pregnancy – bloating, constipation, and decreased energy. Alfalfa, barley, borage, nettles, oatstraw, parsley, and red clover are other herbs that are regarded as nourishing and safe for regular use during pregnancy. In order to reap the nourishing benefits of herbal teas they must be properly prepared. As a general guide herbal teas with a strong smell when you crush the leaves are high in essential oils. These herbal teas, such as mint and lemon, only need to be steeped for 3-5 min, where as many others need to be steeped for 20 minutes or even several hours depending both on the plant and the part of the plant used. Herbal teas can be purchased in bulk (Starwest Botanicals and Mountain Rose Herbs are great), or bags (Earth Mama Angel Baby sells herbal teas specifically for pregnancy). There are various herbal tea suggestions throughout Mara’s World as you explore the articles related to pregnancy discomforts, postpartum healing, and even helping with baby problems such as baby acne. Wherever a specific use is recommended instructions are also given. In addition to any herbal tea that interacts with drugs you are taking, these herbal teas are generally regarded as unsafe during pregnancy: pennyroyal, poke, blue or black cohosh, cayenne, cotton, dong quai, licorice, Lobelia, mistletoe, St. Johns wort, and tansy. There may be others. Educate yourself on any specific herbal tea you are planning to take regularly or in medicinal quantities. The Natural Medicines Comprehensive Database and Natural Standard are two very good resources for information on herbs. It is also helpful to find a local practitioner in naturopathic or herbal medicine who is familiar with pregnancy. Why is this so different than advice I read on other web sites? The primary reason so many web sites caution against herbal teas is because safety is not proven. There simply is not enough research on their safety or their effectiveness. However it is also important to realize that there is a deep disrespect or disbelief in alternative ways of knowing. Herbal knowledge is largely an area of knowledge passed down from one person to another. Women healers and midwives who have used these herbs for generations historically went through periods of persecution. This is related to why skepticism, disrespect, fear, and sensationalized support of herbal use find expression in our culture today. You may find that using herbal tea during pregnancy feels uncomfortable for you because of the lack of research or that it is a meaningful act of connecting with a tradition of knowledge you are proud to keep alive. Perhaps you will have both feelings at the same time. You are certainly entitled to either response, and all the options in between, and I support you in following your intuition combined with the knowledge you gain as you continue your exploration of herbal tea and pregnancy. Red Raspberry. Craig, Winston J. Vibrant Life. 2004 Mar/Apr;20(2):20-21. Image of infused is by user Khairil Zhafri, from Flickr.com, used under license CC-BY-2.0.